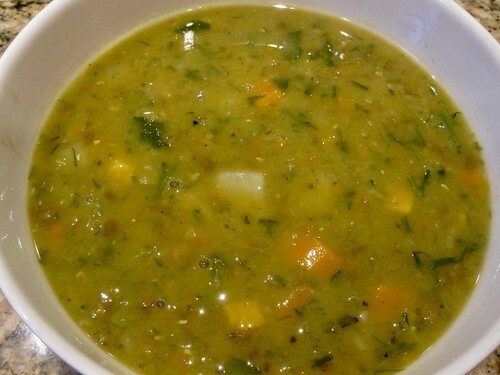 Heat oil olive in pot, add onions carrots and celery, cook for 5 minutes, add garlic, cook another minute, add rest of vegetables, cook another 5 minutes, add lentils and peas, add stock and spices, cook until peas and melted and lentils are tender about an hour. Place about 2 cups of soup in a blender Pulse gently until semi-smooth and creamy-looking, Add back to the pot and stir to combine. Stir in the spinach and parsley. Turn the heat off and let all the flavours come together for a bit before serving. The taste gets better with time and so does the texture. Season to taste and to really go next level, serve with crusty wheat bread and a little Parmesan cheese.